MPJC offer our clients with a comprehensive range of hat are designed with qualitative stainless steel and other raw material sourced from certified vendors. Our company manufactures Ready Cut Shims which are flat and burr free, hence the job of alignment becomes reliable and more accurate. 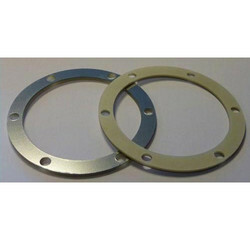 These shims are manufactured by using die/punch process. Moreover, each of the shims is marked individually for thickness resulting easy selection of these shims. Our range of ready cut shims is time and energy saving as there is no need of shims to cut from the sheets. As our shims are made of Stainless Steel, these prove as a useful and permanent investment at our clients premises. We are pleased to introduced PREC-SHIM, duly incorporated into a Manufacturing of Ready Cut Shims, Special Shims (Easy Laser Alignment Tools, Equipment's, Systems for Belts , Shafts & Geometrical measurement) and Washers in Stainless Steel, Stainless Steel Duplex/ Super Duplex, Nickel Alloys, Titanium, Inconel, Monel, Copper, Brass, Aluminium, etc. PRECI-SHIM offers you a range of standard Alignment shims, that suits different rotary equipment bases. Shims find wide application during installation and Alignment of Rotating Equipment, such as Pumps, Compressors, Turbines, Generators, Diesel Engines and also during shut down maintenance of these equipment's. Free from burr & dents. Avoids blockade/Stock of rolls & sheets. We can also cater to your requirements of Shims as per your specific requirement for which we can quote on receiving your drawings/samples. 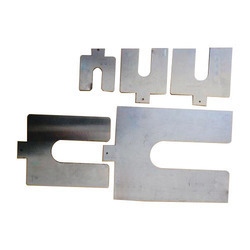 In addition to shims we also manufacture customized name plates. 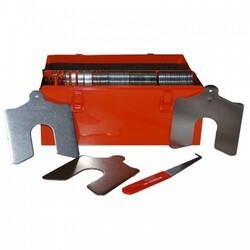 We can fabricate as per your requirement. Do let us know your requirement; so that accordingly we can tell you delivery time. We are the noted manufacturer and supplier of a comprehensive array of Precut Stainless Steel Slotted Shims. Offered slotted shim is inspected on numerous parameters of quality for dispatching a flawless assortment. 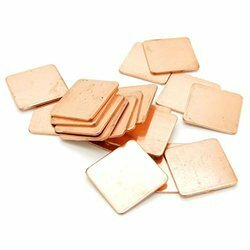 The offered slotted shim is professionally manufactured from the excellent quality material in fulfillment with the market norms. This slotted shim is accessible in different specifications to fulfill the ample desires of patrons. 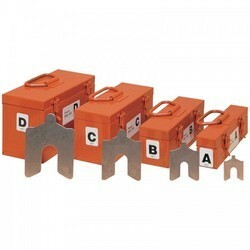 Alignment Tools stainless steel shims are designed for machine alignment. We deliver also various other custom made shim types. The Alignment Tools company pruduces and supplies also a wide range of other stainless steel products - accurate foils, steel strips or feeler gauges. For further information about this products feel free to contact us! Backed by our rich industrial experience in this domain we are devoted towards offering the superlative quality Slotted Shims. 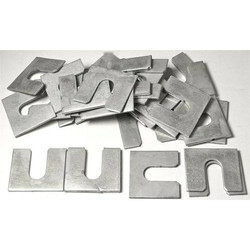 These slotted shims are manufactured with the help of latest techniques using best quality material. Offered slotted shims are thoroughly examined on appropriate quality parameters for make certain its superiority at our end. The provided slotted shims are obtainable at competitive price from us in a stipulated time frame. The products we make are widely used in electronics, personal care, sensors, precision measurement, hardware, semiconductor, optical, communications, automotive engineering, medical, aerospace, petrochemical, military, precision engineering industries, etc. Using photo etching not laser cut or stamping. By photo etching, the edges of the springs is smooth without any burr. By stamping, the mold cost is high and the thin products will be out of shape easily, but photo etching will keet the thin products flat enough. We are able to manufacture different kinds of metal washers as per drawings offered by clients. - Product thickness can be achieved between 0.02 to 5mm. 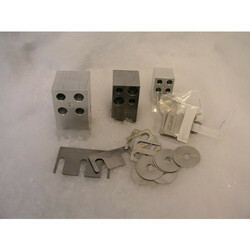 - Product size can be achieved between 1* 1mm to 300* 500mm. - Smallest open hole is 0.1mm. - Smallest line width is 0.025mm. - Product precision is +- 0.01mm (common difference). Its generally 20% of material thickness. The product material we can process includes Stainless steel (including 301, 304, 430, 201,303,316, etc), copper, silicon steel plate, aluminum, nickel, magnetic material and so on. Please feel free to contact with us if you are interested in our products.